WHY DO WHALES COMMIT MASS SUICIDE? Interlocutor: Now I’d like to move on to the topic that has been called as “Suicidal Whales”. Does it have something to do with the genetic code of the species and the end of the life cycle? Ron Hubbard: No, not at all, because if it were it would be something related to their sexual behavior and this is not the. Interlocutor: Do you mean that when the end of life cycle arrives due to genetic code the females become gradually sterile and then the species become extinct? Ron Hubbard: Yes, I meant that, but in this case the behavior of the whales doesn't have anything to do with genetic code. Interlocutor: Why the whales suddenly go to the beach, become stranded and die? Ron Hubbard: There is a common denominator, the more developed the mental decoder is, the more engrams it has, starting with the human being. The whales, the dolphins, as well as other types of cetaceans, they have a quite developed decoder and then they have engrams. When they are depressed they develop suicidal behavior. Interlocutor: Is this kind of suicide due to their depressive behavior caused by engrams? Ron Hubbard: Correct. 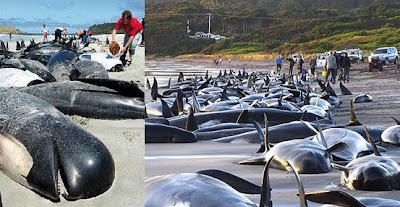 And notice how strong those engrams are that whales that became stranded on the beaches were aided by people moved to pity who tried to move them out to open water, but the whales returned to the beach again with that suicidal behavior. Interlocutor: It’s really remarkable, I’d have never imagined. Is this the whole story that has baffled to those who were investigating the phenomenon? Ron Hubbard: Correct. It’s simply an engramic issue. Interlocutor: Concretely, then, if it weren’t for the reactive mind and those engrams that impel the whales to suicide, this kind of suicidal behavior would not appear? Interlocutor: Is there something more about this? Ron Hubbard: No, what has been said explains the case perfectly. This entry was posted at Thursday, June 11, 2009 and is filed under Mysteries and Enigmas . You can follow any responses to this entry through the .